Also see Epistaxis, Anterior Epistaxis Nasal Pack, Posterior Epistaxis Nasal Pack, and Surgery for Pediatric Epistaxis. Controlling significant bleeding or hemodynamic instability should take precedence over obtaining a lengthy history. Perform a thorough and methodical examination of the nasal cavity. Blowing the nose decreases the effects of local fibrinolysis and removes clots, permitting a better examination. Application of a vasoconstrictor before the examination may reduce hemorrhage and help to pinpoint the precise bleeding site. Topical application of a local anesthetic reduces pain associated with the examination and nasal packing. Gently insert a nasal speculum and spread the naris vertically. This permits visualization of most anterior bleeding sources. Approximately 90% of nosebleeds can be visualized in the anterior portion of the nasal cavity. Massive epistaxis may be confused with hemoptysis or hematemesis. Blood dripping from the posterior nasopharynx confirms a nasal source. A posterior bleeding source is suggested by failure to visualize an anterior source, by hemorrhage from both nares, and by visualization of blood draining in the posterior pharynx. Gowns, gloves, and protective eyewear should be worn. Adequate light is best provided by a headlamp with an adjustable narrow beam. Patients should be positioned comfortably in a seated position, holding a basin under their chin. As always, first address the ABCs (A irway, B reathing, and C irculation). Rarely, severe epistaxis may necessitate endotracheal intubation. Stable patients should be instructed to grasp and pinch their entire nose, maintaining continuous pressure for at least 10 minutes. Make sure that they compress the soft nose tissues against the nasal septum; pinching the hard, incompressible nasal bones will not aid hemorrhage control. Patients with significant hemorrhage should receive an intravenous (IV) line and crystalloid infusion, as well as continuous cardiac monitoring and pulse oximetry. Patients frequently present with an elevated blood pressure; however, a significant reduction can usually be obtained with analgesia and mild sedation alone. Specific antihypertensive therapy is rarely required and should be avoided in the setting of significant hemorrhage. The relation between hypertension and epistaxis is often misunderstood. [5, 6, 7] Patients with epistaxis commonly present with an elevated blood pressure. Epistaxis is more common in hypertensive patients, perhaps owing to vascular fragility from long-standing disease. Hypertension, however, is rarely a direct cause of epistaxis. More commonly, epistaxis and the associated anxiety cause an acute elevation of blood pressure. Therapy, therefore, should be focused on controlling hemorrhage and reducing anxiety as primary means of blood pressure reduction. Insert pledgets soaked with an anesthetic-vasoconstrictor solution into the nasal cavity to anesthetize and shrink nasal mucosa. Soak pledgets in 4% topical cocaine solution or a solution of 4% lidocaine and topical epinephrine (1:10,000) and place them into the nasal cavity. Allow them to remain in place for 10-15 minutes. Traditional anterior nasal packing with petrolatum gauze has largely been supplanted by the use of tampons and balloons, which are readily available and more easily placed. This method is commonly performed incorrectly, using an insufficient amount of packing placed primarily in the anterior naris. 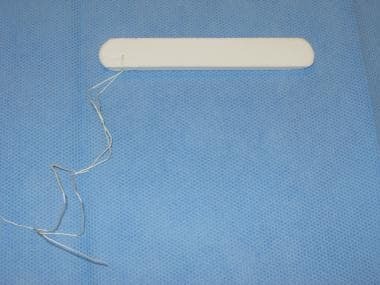 When placed in this way, the gauze serves as a plug rather than as a hemostatic pack. 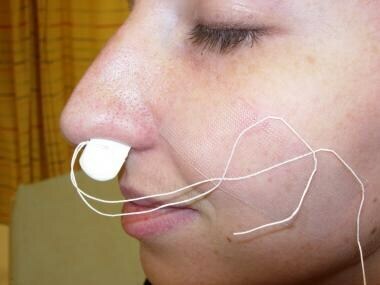 Physicians inexperienced in the proper placement of a gauze pack should use a nasal tampon or balloon instead. The proper technique for placement of a gauze pack is as follows. Grasp the gauze ribbon about 6 inches from its end with a bayonet forceps. Place it in the nasal cavity as far back as possible, ensuring that the free end protrudes from the nose. On the first pass, the gauze is pressed onto the floor of nasopharynx with closed bayonets. Next, grasp the ribbon about 4-5 inches from the nasal alae, and reposition the nasal speculum so that the lower blade holds the ribbon against lower border of the nasal alae. Bring a second strip into the nose, and press downward. Continue this process, layering the gauze from inferior to superior until the naris is completely packed. Both ends of ribbon must protrude from the naris and should be secured with tape. If this measure does not stop the bleeding, consider bilateral nasal packing. Trim the compressed sponge (eg Merocel) to fit snugly through the naris. Moisten the tip with surgical lubricant or topical antibiotic ointment. Firmly grasp the length of the sponge with a bayonet forceps, spread the naris vertically with a nasal speculum, and advance the sponge along the floor of the nasal cavity. Once wet with blood or a small amount of saline, the sponge expands to fill the nasal cavity and tamponade bleeding (see the images below). Merocel placed in left nostril for anterior packing. Anterior epistaxis balloons (eg, Rapid Rhino) are available in different lengths (see the images below). A carboxycellulose outer layer promotes platelet aggregation. 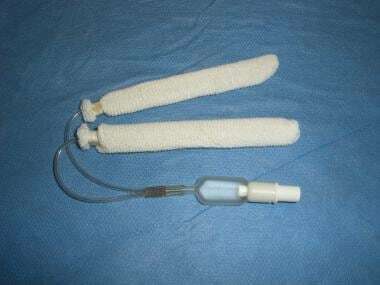 The balloons are as efficacious as nasal tampons, easier to insert and remove, and more comfortable for the patient. To insert the balloon, soak its knit outer layer with water, insert it along the floor of the nasal cavity, and inflate it slowly with air until the bleeding stops. Rapid Rhino - 5.5 cm for anterior nasal packing. Rapid Rhino bilateral - 7.5 cm for anterior/posterior nasal packing. Posterior epistaxis is frequently treated with double-balloon devices that have separate anterior and posterior balloons. After passing the posterior balloon through the naris and into the posterior nasal cavity, inflate it with 4-5 mL of sterile water, and gently pull it forward to fit snugly in the posterior choana. After bleeding into the posterior pharynx has been controlled, fill the anterior balloon with sterile water until the bleeding completely stops. Avoid overinflation, because pressure necrosis or damage to the septum may result. Record the amount of fluid placed in each balloon. If a Foley catheter is used, place a 12-16 French catheter with a 30-mL balloon into the nose along the floor of the nasopharynx, until the tip is visible in the posterior pharynx. Slowly inflate the balloon with 15 mL of sterile water, pull it anteriorly until it is firmly seated against the posterior choanae, and secure it in place with an umbilical clamp. 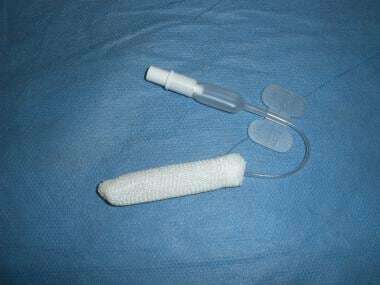 Use a buttress clamp with cotton gauze to avoid pressure necrosis on the nasal alae or columella. Finally, place an anterior nasal pack. Also see Anterior Epistaxis Nasal Pack and Posterior Epistaxis Nasal Pack. Attempts at nasal packing may result in significant slowing but not cessation of hemorrhage. Failure to completely control hemorrhage is an absolute indication for consultation with an otolaryngologist in the emergency department (ED). Epistaxis that requires posterior packing should be managed in cooperation with an otolaryngologist. Because of multiple possible complications, admission is required, usually in a monitored setting. Consultation with a hematologist is indicated for patients with bleeding dyscrasias or coagulopathies. Admit patients with posterior packing. Posterior nasal packing is particularly uncomfortable for the patient and promotes hypoxia and hypoventilation. Failure to admit and appropriately monitor all patients who require posterior packing may result in significant mortality. Elderly patients or patients with cardiac disorders or chronic obstructive pulmonary disease (COPD) should receive supplemental oxygen and be admitted to a monitored setting. Patients discharged from the hospital with anterior packing should receive follow-up care with an otolaryngologist within 48-72 h. Nasal packing prevents drainage of sinuses and increases the risk of sinusitis or toxic shock syndrome. Consider placing patients on a broad-spectrum antibiotic (eg, a penicillin or first-generation cephalosporin) to cover all likely pathogens in the context of the clinical setting. Oral analgesics should also be prescribed. Pain control is essential to quality patient care: it ensures patient comfort, promotes pulmonary toilet, and enables physical therapy regimens. Most analgesics have sedating properties, which are beneficial for patients who have painful skin lesions. Advise patients to avoid aspirin, aspirin-containing products, and nonsteroidal anti-inflammatory drugs (NSAIDs). Patients who take warfarin may generally continue their current regimen unchanged. Temporary discontinuation of warfarin or active reversal of coagulopathy is indicated only in cases of uncontrolled hemorrhage and a supratherapeutic international normalized ratio (INR). For patient education resources, see the Ears, Nose, and Throat Center, as well as Nosebleeds. Van Wyk FC, Massey S, Worley G, Brady S. Do all epistaxis patients with a nasal pack need admission? A retrospective study of 116 patients managed in accident and emergency according to a peer reviewed protocol. J Laryngol Otol. 2007 Mar. 121(3):222-7. [Medline]. Ando Y, Iimura J, Arai S, Arai C, Komori M, Tsuyumu M, et al. Risk factors for recurrent epistaxis: Importance of initial treatment. Auris Nasus Larynx. 2013 Jun 19. [Medline]. Szyszkowicz M, Shutt R, Kousha T, et al. Air pollution and emergency department visits for epistaxis. Clin Otolaryngol. 2014 Dec. 39(6):345-51. [Medline]. Kemal O, Sen E. Does the weather really affect epistaxis?. B-ENT. 2014. 10(3):199-202. [Medline]. Fuchs FD, Moreira LB, Pires CP, et al. Absence of association between hypertension and epistaxis: a population-based study. Blood Press. 2003. 12(3):145-8. [Medline]. Herkner H, Havel C, Mullner M. Active epistaxis at ED presentation is associated with arterial hypertension. Am J Emerg Med. 2002 Mar. 20(2):92-5. [Medline]. Karras DJ, Ufberg JW, Harrigan RA, et al. Lack of relationship between hypertension-associated symptoms and blood pressure in hypertensive ED patients. Am J Emerg Med. 2005 Mar. 23(2):106-10. [Medline]. Cummings CW. Epistaxis. Cummings: Otolaryngology: Head and Neck Surgery. 4th ed. Philadelphia, Pa: Elsevier, Mosby; 2005. Chap 40. Badran K, Malik TH, Belloso A, Timms MS. Randomized controlled trial comparing Merocel and RapidRhino packing in the management of anterior epistaxis. Clin Otolaryngol. 2005 Aug. 30(4):333-7. [Medline]. Cook PR, Renner G, Williams F. A comparison of nasal balloons and posterior gauze packs for posterior epistaxis. Ear Nose Throat J. 1985 Sep. 64(9):446-9. [Medline]. Corbridge RJ, Djazaeri B, Hellier WP, Hadley J. A prospective randomized controlled trial comparing the use of merocel nasal tampons and BIPP in the control of acute epistaxis. Clin Otolaryngol Allied Sci. 1995 Aug. 20(4):305-7. [Medline]. Pope LE, Hobbs CG. Epistaxis: an update on current management. Postgrad Med J. 2005 May. 81(955):309-14. [Medline]. Singer AJ, Blanda M, Cronin K, et al. Comparison of nasal tampons for the treatment of epistaxis in the emergency department: a randomized controlled trial. Ann Emerg Med. 2005 Feb. 45(2):134-9. [Medline]. Kamhieh Y, Fox H. Tranexamic acid in epistaxis: a systematic review. Clin Otolaryngol. 2016 Dec. 41 (6):771-6. [Medline]. Buiret G, Pavic M, Pignat JC, Pasquet F. Gelatin-thrombin matrix: a new and simple way to manage recurrent epistaxis in hematology units. Case Rep Otolaryngol. 2013. 2013:851270. [Medline]. [Full Text]. Yilmaz M, Mamanov M, Yener M, Aydin F, Kizilkilic O, Eren A. Acute ischemia of the parotid gland and auricle following embolization for epistaxis. Laryngoscope. 2013 Feb. 123(2):366-8. [Medline]. Teymoortash A, Sesterhenn A, Kress R, et al. Efficacy of ice packs in the management of epistaxis. Clin Otolaryngol Allied Sci. 2003 Dec. 28(6):545-7. [Medline]. The authors and editors of Medscape Reference gratefully acknowledge the contributions of previous authors Jeffrey A Evans, MD, and Todd Rothenhaus, MD, to the development and writing of the source article.